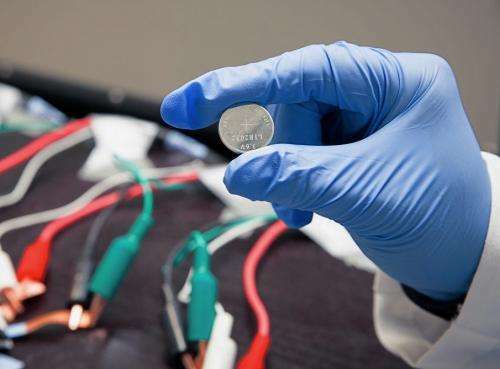 Researchers have made the first battery electrode that heals itself, opening a new and potentially commercially viable path for making the next generation of lithium ion batteries for electric cars, cell phones and other devices. The secret is a stretchy polymer that coats the electrode, binds it together and spontaneously heals tiny cracks that develop during battery operation, said the team from Stanford University and the Department of Energy's (DOE) SLAC National Accelerator Laboratory. They reported the advance in the Nov. 19 issue of Nature Chemistry. "Self-healing is very important for the survival and long lifetimes of animals and plants," said Chao Wang, a postdoctoral researcher at Stanford and one of two principal authors of the paper. "We want to incorporate this feature into lithium ion batteries so they will have a long lifetime as well." "We found that silicon electrodes lasted 10 times longer when coated with the self-healing polymer, which repaired any cracks within just a few hours," Bao said. "Their capacity for storing energy is in the practical range now, but we would certainly like to push that," said Yi Cui, an associate professor at SLAC and Stanford who led the research with Bao. The electrodes worked for about 100 charge-discharge cycles without significantly losing their energy storage capacity. "That's still quite a way from the goal of about 500 cycles for cell phones and 3,000 cycles for an electric vehicle," Cui said, "but the promise is there, and from all our data it looks like it's working." Researchers in Cui's lab and elsewhere have tested a number of ways to keep silicon electrodes intact and improve their performance. Some are being explored for commercial uses, but many involve exotic materials and fabrication techniques that are challenging to scale up for production. The self-healing electrode, which is made from silicon microparticles that are widely used in the semiconductor and solar cell industry, is the first solution that seems to offer a practical road forward, Cui said. The researchers said they think this approach could work for other electrode materials as well, and they will continue to refine the technique to improve the silicon electrode's performance and longevity. RRRRRiiiiight.... and my name is Leslie Nielsen, the powers that be will stuff this one, like all the rest before it so deep down the rabbit hole, because why ???? O nooooo... we may never have a self healing battery actually come into existence. hint...;) ;) hint... "my precious oil money will make sure of it...."
So then, self-healing prosthetics in the near future? That would be something. True. I've had the opportunity to get an in depth look at revision implants for hips from various manufacturers. Often these need to be afixed using sideways screws/bolts through the lower part of the femur. The manufacturers plainly admit that these screws are likely to break eventually - as you can't make their diameter arbitrarily large. Self healing components would be great in that area.